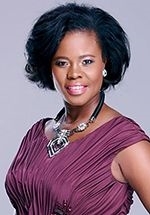 Nthati Moshesh is a South African actress best known for her leading roles in the drama series Home Affairs (2005-2006) and the soapie 7de Laan (2000-2002). Nthati was born in Katlehong on the East Rand in 1969. She matriculated at St. Andrews Girls School in Bedfordview. She studied drama from Matric and her main interest is film. One of the highlights of her career was the first film she did on location in Zimbabwe, Kini and Adam, which was on the official selection list for the 1996 Cannes Film Festival. In 2000 she played the lead in Anant Singh's film The Long Run and in 2002 appeared in the film Kin, starring Miranda Otto and Isaiah Washington. Her other film credits include roles in Beat The Drum (2003); Round Trip (2003, in which she had a starring role as a Nigerian woman hired as a nanny by an Israeli couple, only to have a lesbian affair with the wife); and Cape Of Good Hope (2004). Her TV credits include roles the series 7de Laan; Soldier, Soldier; Gaz'lam; Home Affairs; Interrogation Room; The Deafening Silence; Scout's Safari (for the US Discovery Channel); Snitch; and Homecoming. She has also acted in the mini-series Human Cargo (2004) and Whiskey Echo (2005); and the made-for-TV movies Pride of Africa (1997) and Only Love (1998). In 2004 she won a Canadian Gemini Award (the Canadian equivalent of an Emmy) for her role as Odette in Human Cargo, as well as the award for Best Performance by an Actress in a Featured Supporting Role in a Dramatic Program or Mini-Series. She appeared in the Dutch feature film The Seven of Daran: Battle of Pareo Rock (2008) and played the role of Blessed in two episodes of the British drama series Silent Witness, also in 2008. She was one of the featured celebrities on the first season of the South African version of the genealogy documentary series Who Do You Think You Are? (based on the British series of the same name), which premiered on SABC2 in May 2009. In 2013 she had a starring role in the Mzansi Magic miniseries Naledi and in 2014 played the lead role of Dibuseng Makwarela in the SABC2 thriller series Thola. How did you get into acting/presenting? You get paid for having fun. What qualities do you admire most in a person? ...the love of my life! My man! What's the most extravagant thing that you've bought? On what do you enjoy spending your money? Who had the most influence on you as a child? What was the hardest lesson you've learnt?